Our organization holds expertise in offering our valuable clients a wide gamut of Aluminum Extrusion Billet. The entire range is available in different standards and customized specifications, and broadly used in different architectural purposes, electrical & mechanical engineering works and building & construction. Our range of Aluminum Billets is manufactured using Homogenized Wagstaff technology. These Aluminum Billets are basically used in for extrusion purpose to make aluminum extruded profiles. We assure that the billets supplied by us across the globe, are in line with international quality norms. 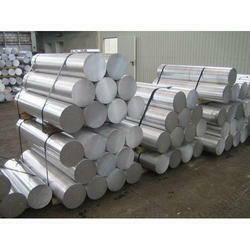 , Supplier and Exporter of Aluminum Billets. We are involved in dealing an exquisite range of Aluminum Extrusion Billet to fulfill the needs of our customers. The entire range of our product is manufactured using top-class base material sourced from reliable dealers of the industry. Moreover, this Aluminum Billet is sturdy in built with optimum strength. 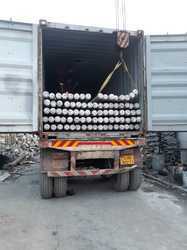 Material: Aluminium 97 to 98 %.6063.6061.8011. 12 mm to 140 mm thickHot rolled plate. Extrusion billets used in tube and profile manufacture have a high demand on material properties and surface finish. As Europe's leading producer of extrusion billets, Sandvik has many years of experience in this product, which has proved to be a prerequisite for uniformity and consistent high quality. We have earned a place of reputation in this era of stiff market competition, by providing the best class Aluminum Extrusion Billet.